This section explains you about managing mobile devices without exposing the Mobile Device Manager Plus Server directly to the internet. This can be achieved with the use of a Secure Gateway. This ensures that the Mobile Device Manager Plus Server is secure from risks and threats from vulnerable attacks. ManageEngine Secure Gateway is a component that will be exposed to the internet. This Secure Gateway acts as an intermediate between the managed mobile devices and the Mobile Device Manager Plus server. If MDM server has been setup in De-Militarized Zone(DMZ), then Secure Gateway is need not to be configured, as MDM server in DMZ is most secure. Mobile Device Manager Plus server communicates with the APNs/FCM/WNS to wake the mobile device. All communications from the mobile device will be navigated through the Secure Gateway. When the device tries to contact the Mobile Device Manager Plus server, Secure Gateway receives all the connections and redirects to the Mobile Device Manager Plus Server. (If you're using MDM in Desktop Central), NAT settings can be configured by navigating to NAT under Settings dropdown in the left pane. Learn how to setup Secure Gateway in 3 minutes through this demo video. Enter the Mobile Device Manager Plus Server Name, HTTP and HTTPS Port numbers, when prompted and click Next. Ensure that you use Run As Administrator and have necessary permissions to install the service. On the machine running Secure Gateway, click on the Start menu, enter Add or remove programs in the search box and open it. Now, choose ManageEngine Secure Gateway Server from the list of installed programs. To remove the Secure Gateway, select Uninstall and click on Finish on the InstallShield Wizard. Ensure FQDN on the MDM Server remains identical to that of the deleted Secure Gateway Server. If the FQDN varies or if it is unreachable, existing managed devices will lose contact with the MDM Server. 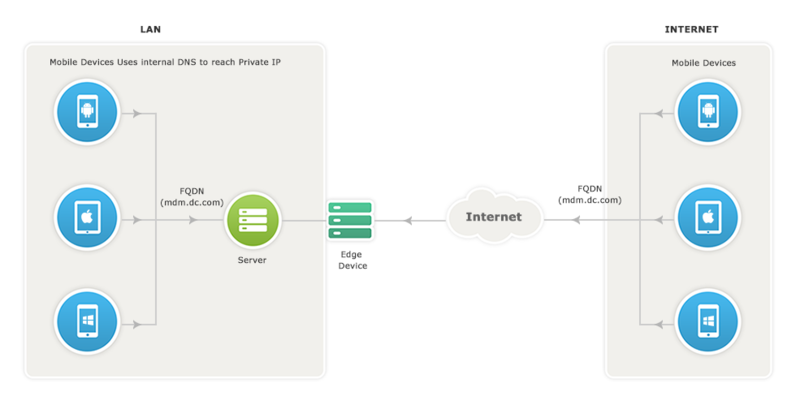 Verify whether the MDM server is reachable via public IP/FQDN address configured in NAT settings.